As women's history month comes to a close this week, the city of Buffalo held its annual celebration, "Weaving the Stories of Women's Lives" at City Hall Monday. 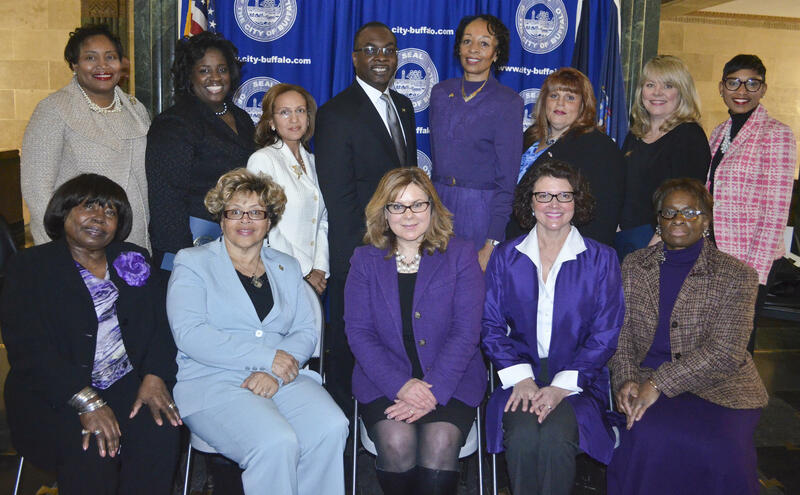 Several area women were recognized and given awards from Buffalo Mayor Byron Brown for their work and accomplishments. "Women in this community make history not every year, not every month, but they make history every week and every day," said Mayor Byron Brown. 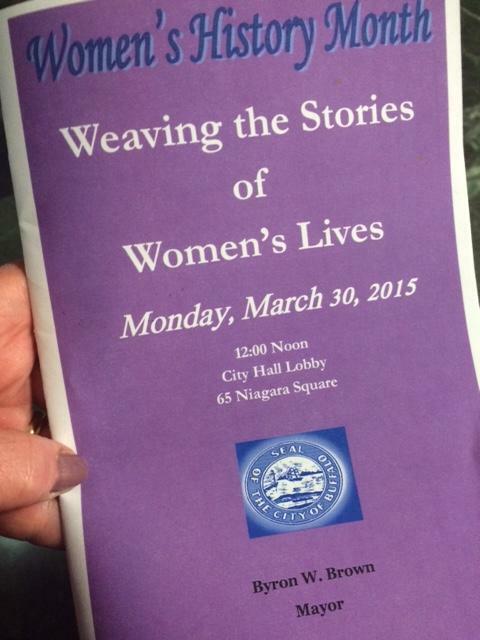 Women's History Month program for City Hall celebration. Deputy Mayor Ellen Grant noted for the first time in local history there are two women on deputy levels in the city and Erie County government. Grant said it is so important for the continued fight for equal pay, equal education and child care to support women in their goals. "Why wouldn't men want their wives, their daughters, to have the same pay as husbands and sons. That is the moral and right thing," said Grant. Granted noted the issue of child care is an economic issue, that if not address could 'undercut the mission of a working, thriving community'. In presenting the awards, Mayor Brown said the women were being honored for diversity and inclusion. "Women in this community make history not every year, not every month, but they make history every week and every day," stated Mayor Brown. "The leadership that they show each and everyday to move the city of Buffalo forward." Monday's celebration included an invocation from Pastor Rachelle Robinson, Founder Deep Wells Ministry, Associate Pastor at First Shiloh Baptist Church in Buffalo. Annette Daniels Taylor, actress, playwright and poet, performed a reading titled Rose Butler dies on Friday. Women's History Month celebration, 'Weaving the Stories of Women's Lives' in lobby of City Hall. 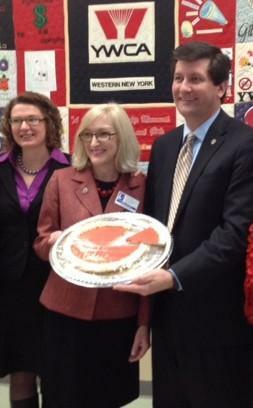 Credit Photo provided by City of Buffalo. Stephanie Lynn Crockatt, Senior Director of Institutional Advancement & Interim Executive Director of Buffalo Olmsted Parks Conservancy, Florence Johnson, Project Director of Student Support Services at SUNY Buffalo State, Catherine Roberts, Senior Vice President of the Community Action Organization of Erie County, Yolanda Martinez-Rodriguez, Localization Senior Program Manager at Fisher-Price, New York State Supreme Court Justice Shirley Troutman, Gloria Hernadez, Chair of the Miss Borinquen Leadership program for teenage girls, Fern Beavers & Dr. Sharon Amos, both with Stories of WNY Minority Military Women & Men, Dottie Gallagher-Cohen & Clotilde Perez-Bode Dedecker for role of The Racial Equity Roundtable and Detra Trueheart, Founder & President of the Young Miss Buffalo Pageant. Women's History Month places the spotlight on those whose contributions may have previously gone unnoticed. Sawrie Becker, commissioner of Office of Public Advocacy with the Erie County Commission on the Status of Women, says women's history offers valuable lessons. "Courage is probably the most important thing. To be willing to take a stand when it may not be the popular thing to do."